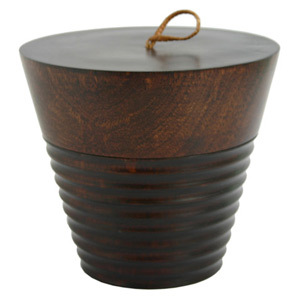 Alluring contours and dark color distinguish this mango wood box. 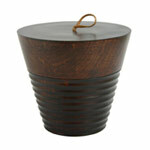 The artisans shape the piece like a cone with sleek lid and ridged body. They place a practical bamboo handle on top of the lid. Charming with its glow and simple authenticity, this piece will lend a touch of Asia to any room. Size: 17.5 cm Diam x 15.0 cm H.
Materials: Mango wood and bamboo. This box is handcrafted by artisans in a large workshop located in Chiang Mai, Thailand.